The Premier League 2013 starts on 7 February and the fourteen regular season games will be completed on May 9. For the first rime in history there will be ten players competing in the Premier League. The participants in the Premier League this year are: Phil Taylor, Raymond van Barneveld, Adrian Lewis, James Wade, Gary Anderson, Simon Whitlock, Andy Hamilton, Michael van Gerwen, Wes Newton and Robert Thornton. In the first nine weeks all competitors will play each other ones. After these 9 weeks the bottom two will relegate. The other 8 will play each other ones again in the remaining five weeks. After 14 weeks the top four of the ranking will qualify for the playoffs which will be played on 16 May at the O2 Arena in London. Gary Anderson and Wes Newton are the two to relegate after nine weeks. After 14 weeks for the first time in history it's not Phil Taylor at the top of the rankings, but the Dutch debutant Michael van Gerwen. Raymond van Barneveld finishes in 2nd place, Phil Taylor in third place and James Wade completes the four semi-finalists. 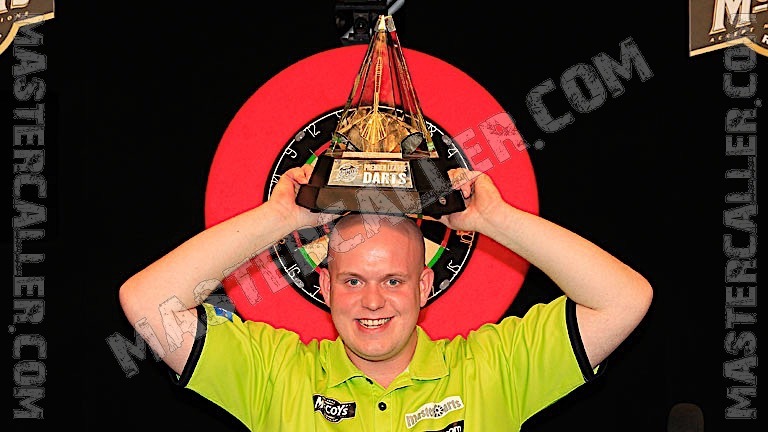 On the finals night Van Gerwen again prooves to be the strongest, he beats James Wade in the semi-finals. Phil Taylor is doing the same in the other semi-final to Raymond van Barneveld. Michael van Gerwen beats Phil Taylor in a stunning finale in which he coverts a 2-5 deficit in a 10-8 victory. He is the first non-British winner of the Premier League.